McReynolds Winery is family owned and operated by Gerald (Mac) and Maureen McReynolds in the small Texas Hill Country community of Cypress Mill, Texas, 40 miles West of Austin. 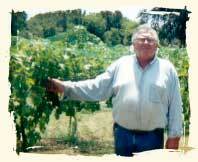 We began our winemaking careers while living in California in the early 1970's. While we were both employed full-time doing scientific research at Stanford University in Palo Alto, California, we began to enjoy the pleasures of visiting local wineries and learning about winemaking styles and techniques. We were given the opportunity to work at two Santa Clara County wineries, Mirassou and Ridge, on a part time basis. As our knowledge and interest grew, we joined with several friends to begin buying grapes and making wine as amateur wine-makers. After returning to Austin, we became active in the Texas Wine and Grape Growers Association and watched the Texas wine industry grow and prosper. In 1989, we purchased 5 acres in the Texas Hill Country which included a small house and a large metal frame building that had formerly housed a winery. Although we hoped to eventually have our own winery, we were not quite ready. Cypress Mill was a place for us to get away from city life. We again began buying wine grapes and making wine as home winemakers. Our 1995 Texas Shiraz was awarded gold medals at both the Texas Wine and Grape Growers competition and the Lone Star Wine Competition at the 1997 Texas State Fair. After several subsequent successful non-commercial vintages, we decided to convert our Hill country "retreat" into a commercial winery. We opened our doors with our first wines for sale in April 2000. Our log cabin tasting room and gift shop is small and informal. We enjoy the opportunity to sit and chat with our visitors while giving them a taste of the wines. There is a large picnic area under our magnificent oak trees where guests can enjoy a picnic or a cheese plate purchased at the winery. Our small vineyard on site has begun producing grapes and we released our first Estate Wine last year, a red blend called McReyd. Our new wine dog comes from a loving family who had to give her up. She is tan and white with a patch of white fur in an arrow-head shape on her neck, hence her original name Arrow. We changed the spelling to Aero in honor of Mac’s forty-some years as a private pilot and ten years as airport manager in Smithville, TX.